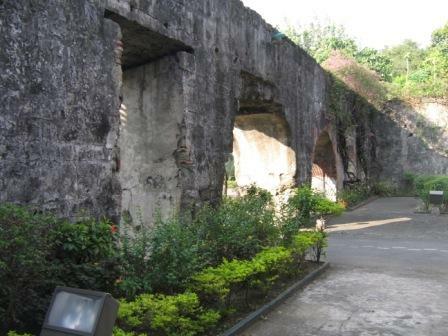 Fort Santiago Photos bring you up close if you cannot get there. Like most attractions in Manila and anywhere else for that matter, just describing it in writing never does the attraction any justice. As they say a picture is worth a thousand words and in the case of Fort Santiago that statement could never be more true. 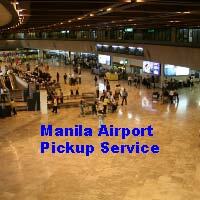 That is why I put together Fort Santiago photos. The Fort Santiago photos are large enough to get a proper look at and you get the opportunity to feel the place. As you can see Fort Santiago was heavily fortified. Thick stonewalls, moat to stop invaders and high walls to prevent access. Yet originally when it was first built in 1571, it was made of wood and dirt, that is until it was destroyed during an attack in 1574. So they rebuilt Fort Santiago of stone as you can see and it lasted until the Battle of Manila in 1945. 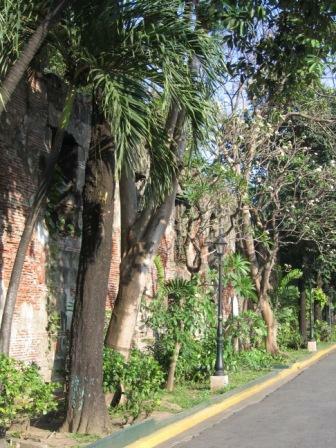 The entrance to Fort Santiago is quite small, it leads into another wall, which is not fortified. Beyond the arch entrance you can see an expansive lawn, on the far side you will find Rizal's Shrine. The British used Fort Santiago as it's headquarters from 1762 to 1764 and was also the headquarters to the Imperial Japanese Army in 1942. This archway is the second wall just on the inside of the main entrance and wall. 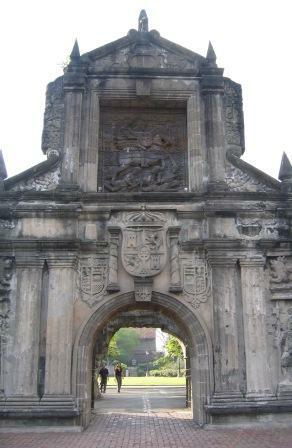 The archway leads into Fort Santiago proper. 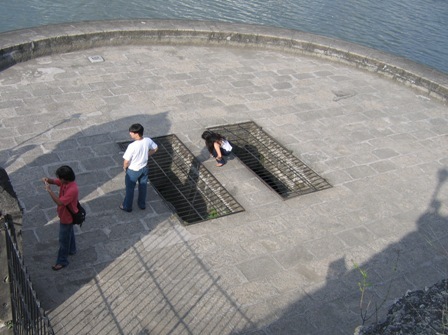 Where I have taken the photo are stairs to take you up to the walls of Fort Santiago. Make sure you walk around the walls of the fort as they give you a great view of both the outside and inside of Fort Santiago. The statue at the end of the lawn, which is called the Plaza Armas, is of Dr Jose Rizal. It is a shrine of remembrance and stands on the site where he was imprisoned. On the right of the photo is the Dulang Rajah Soliman, which is now used as a theatre. The left hand side of this building is the now chapel, then cell of Dr Jose Rizal, where he spent his last night on earth. These dungeons have imprisoned political activists, civilians, revolutionaries and many others. It was here that they were tortured and executed. I had a look inside the dungeons and talk about oppressive, it makes you realise know matter how bad you think life is, nothing would compare to being stuck in one of these dungeons. 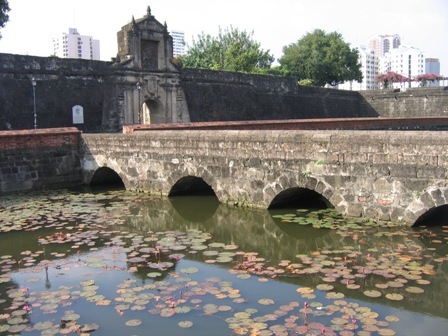 This Fort Santiago photo was taken from in front of the forts main gateway looking out across the moat. You see the Flagpole flying the Philippines Flag, this is in the Plaza Moriones or the public promenade. The public promenade is a green area quite peaceful complete with it's own fountain. 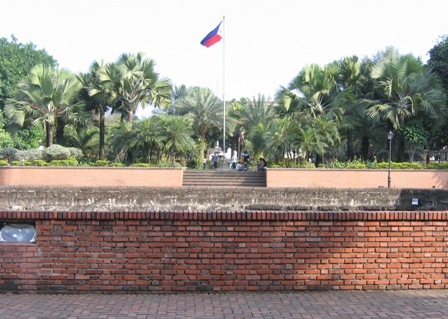 A road travels down both sides of the plaza and it was down the left-hand side, as you look at the photos, that Jose Rizal walked to his execution in what is now Rizal Park. This photo probably looks a bit non-descript, however if you look behind the trees you will notice a brick wall of sorts. This was the Royal Warehouse or Almacenes Reales. It was built in the 1500's and was used to store goods that were unloaded from galleons on the Pasig River which runs right past Fort Santiago. These footprints were brass covered, but I guess time has seen them be lifted. 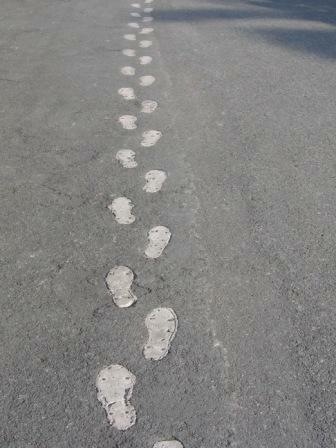 The footprints show the path taken by Jose Rizal from his dungeon in Fort Santiago to his final execution place at Bagumbayan in Rizal Park. 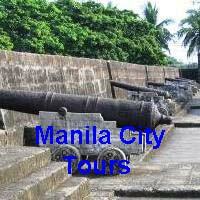 Now if you want more information on Fort Santiago, have a look here. 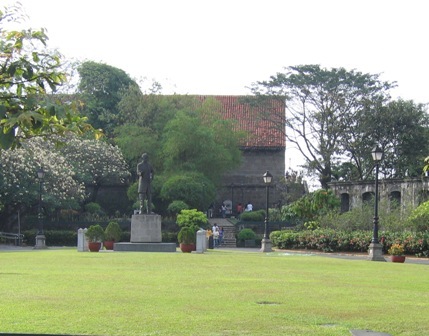 Information on Intramuros, which is where you will find Fort Santiago, can be found here.